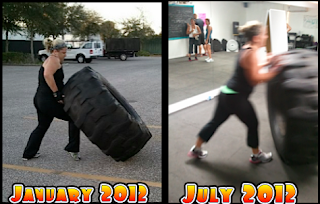 Mindy's fitness Journey: Independence Day! After 7 Years of Finding Myself, I think I am doing pretty well! As I was lying in bed the other night, I realized that it was the day before my very own Independence Day. When I say independence day, I mean my very own personal independence. I was with my son's father for almost 10 years. We had only been married for three, but right after my son's second birthday, I started noticing the way I was being treated. I realized that I was allowing someone to verbally abuse me. I lived in fear. Not fear of being hit... I remember wishing he would hit me. I remember cowering in the corner of our walk-in closet while he stood over me screaming. I remember the spittle coming out of his mouth and his pulling his arm back to hit me. I also remember him laughing, a terribly evil laugh as I flinched. He would say, "I'm not going to hit you!" And walk away. Even writing down those words brings tears to my eyes. Unless you live through that terror, you will never understand what it does to your soul. My biggest revelation was while I was watching Oprah. She had a woman on, and she was talking about verbal abuse. They had a hidden camera in the house to show how cruel Eddie (the husband) was. At one point in the video, the wife, Kim, said she would fear the time of day when she knew Eddie would be home. I remember thinking in my head, "Who would stay in a relationship like that?" It was at that exact time that I remember looking at the clock. It was 4:22 pm. I knew my husband would be home around 4:30. I shot up and started frantically cleaning and thinking of what to prepare for dinner. My thoughts turned to, "Oh no, he's going to be mad the house is a mess! He's going to wonder what I have been doing for the last 30 min. since I have been home. Why Am I so stupid! I know better!" Suddenly, I stopped dead in my tracks. There were tears rolling down my face. I sat on the couch and watched the rest of the show. For some reason (maybe God intervened! Who knows) he was late coming home from work that day. As I watched, I realized that I was living as horribly as Kim. When the show, Emotional Torture originally aired, it was Oct. 4, 2004. I didn't leave my marriage until Oct. 26, 2005. It took my son sitting in his high chair saying, "Stop it Daddy, that's my mommy!" for me to realize that I was damaging my son's life too. And honestly, even when I left, I didn't really plan to leave forever. I truly believe God steered my car to my parents house that night! It's pretty amazing how the chips fell. It's almost comical right now because I am apprehensive about even writing this because I feel like it couldn't have really been that bad. But it was. I have video to prove it. I used to video him during his rants because it would make him stop. Toward the end of our relationships, he kept going even with the camera on. I have not watched the last evening's video in years. I am not sure why I have held onto it. For some time I worried that my son would be angry at me for leaving and his dad would try to turn him against me. I always thought I would have the video to prove it wasn't me who destroyed our family. In my seven years of freedom and peace, I realize that I would NEVER show my son that side of his father. I pray for his dad daily. I pray for him to be a better man and a better husband and father to his new family. I pray that he already is. For me, I am single and truly happy. I always thought I would get married right away. I didn't want to be alone. And truthfully, I would like to find someone great to share my life with. But for now, I am sharing my life with a 9 year old who keeps me busy and makes me laugh. We have a pretty good thing going these days. I have realized that when a marriage or a relationship ends, it is important to be alone. Everyone needs to heal and figure out who he or she is. For me, it took a little over 6 years for me to find the woman in me who wants fitness and health in her life. I have been happier in the last 9 months than any other time in my life. I wish I had found fitness and the fitness community 7 years ago, but this has been my journey, and now it's Mindy's Fitness Journey! Congratulations on your Independence, and for saving yourself and your son, too. It takes such courage to get out and stay out and I am sure you are thankful to have had your family to turn to. Good for you for continuing to grow and get to know Mindy! Happy Independence Day to you:) Congratulations for taking that really difficult step to leave and keep yourself safe. It's SO. HARD. to do, and you are very strong to be able to do it. I hope your story will give others in your position the strength they need to also keep themselves and their children safe. Girl you are so strong! Thank you so much for sharing your story, it's how others find strength and courage! Oh my gosh Mindy, you just told part of my story! I also was verbally abused by my ex husband, but unfortunately I turned to alcohol to deal with it. It took me 3 years to leave mine and I had to leave my boys because he threatened me if I took them with me. That was the hardest thing ever! It was a God thing that it happened that way, because of what happened in the last 3 years. Thank you so much for sharing your story and you are awesome! Regina, I am so sorry! It's so hard when you are living through it. I'm sure, just like me, you tried to pretend it was normal. Or when the good was good, it was ok... so hard... I am glad to know you are on the right track!!! Happy Independence day Mindy! You are a strong and amazing woman! Your son is blessed to have you as a mother!!!! How awesome is it that you not only stood up to him and took your life back, but you think and love enough to continue to pray for him to be a better man. Thank you for sharing this!!! Thank you Joanna for finding the good in me. I have struggled all day with posting this. I am worried that he will find out. I need to realize he has no control over me anymore! I'm so sorry for all you've been through, but thank God, you got out! You are an incredibly strong woman. Thank you for sharing your story with us. Mindy, you are such an inspiration. It took an incredible amount of strength to get out of that situation, and to believe in yourself enough to start and succeed in your fitness journey, too. Congratulations on all. Thank you so much for sharing your powerful story. Thank you! It means so much to me that you would take the time to share your feelings with me. You are very brave for sharing your story and I am sure all of us in this community are thankful for that! I am sorry for what you went through but you clearly emerged as a strong, confident woman! Thank you again for sharing! You are such an inspiration to women on so many levels. I don't even know how I found your blog or your Facebook page but I believe you and your story were put in my life for a reason. Continued good luck and good health to you on this journey. You are not only beautiful, but inspiring and strong. As I learn more and more about you I continue to be amazed by your bravery and your strength. Thanks for being a good friend, colleague and inspiration! Wow! Thank you! You are so sweet! And you inspire me daily as well! Mindy - I work with survivors of domestic violence. I am so incredibly proud of you for putting this post up! I know that it took quite a bit of courage and strength to first write the post and then to publish it but I have no doubt that you just helped flip the light switch in someone's head that verbal abuse is NOT ok. You are an inspiration; keep up the amazing work! It did take courage. And I don't have enough courage to put it out there to all of my friends yet. I am not sure I need everyone around me to see me as a recovered victim yet. I don't know that I am needing that role! I like feeling like a survivor! I don't need the pitty that I know people will give. I am responsible for what I allowed to happen. I just chalk it up to being young and wanting so badly to be in love! :) Thank you though. I am sure this won't be my last. good for your mindy. you are a true inspiration. so sorry you ever had to deal with that. Thanks! As always there are good days and bad! Good for you!! You are a strong and independent woman. Such an inspiration! Isn't it sad the things that women will put up with in a relationship? My former relationship wasn't nearly as bad as how yours sounds, but it's like you have so much love for the person, despite how horribly you are treated, that it's hard, and terrifying to do anything about it. I am so proud of you for being super strong for you and your son, and turning your life around for the better. You are a superstar, Mindy! Thank you! My son saved my life! That is for sure. Not saying my ex would have hurt me physically, but I know that I wouldn't be the woman I am today... I know that I don't even recognize the shell of the person that I used to be. I was so empty and so fragile. Thank you Crystal. I thank God every day! Wow Mindy. I am so sorry that happened to you! It is amazing how strong you are and that you got out. So many women can't leave. You are everything to your son and he is so lucky to have you. Amazing! It takes a lot of strength to get out of situation like that. I can partially relate from my past but I know that everyone's story is different. I'm glad that you got yourself and your son out of the horrible situation. Wishing you all the best!